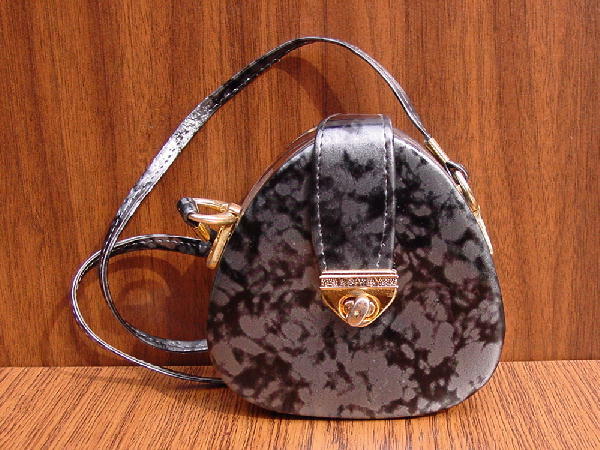 This little dark gray and black marbelized pattern purse is made of plastic. It has a top/front flap gold-tone closure with Italy written in elevated letters across the closure ornament. It has a 31" matching shoulder strap attached to the sides by 2 gold-tone loops. There is a black fabric interior with a mini open pocket. It's big enough to carry a cell phone, keys, credit cards, and some makeup. A model used it to go clubbing in L.A.